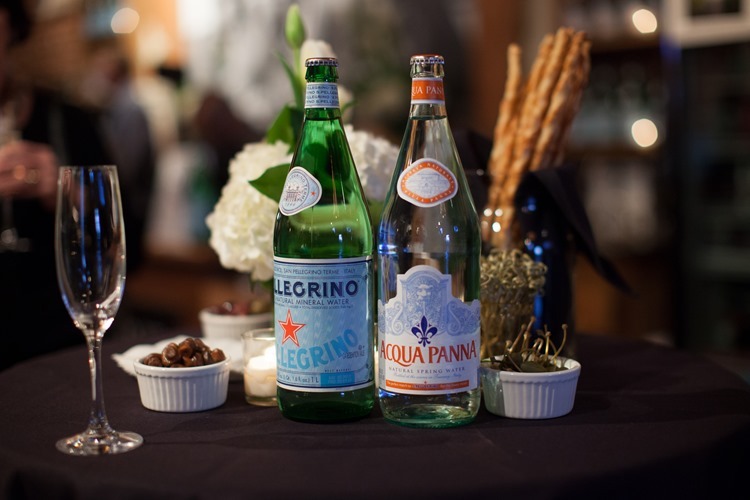 In celebration of this year’s S. Pellegrino Almost Famous Chef Competition, San Pellegrino has given me a $150 Gift Certificate to Chef Mark McEwan’s Fabbrica to give away to one of you. Well, one of you who is brave enough to tell me about your Chef Obsession. Tell me about your favourite Canadian Chefs – each chef you tell me about gets you another entry in the random draw. You don’t have to know them personally, but you do need to tell me something about them and why you are obsessing over them (or they are your favourites). I won’t judge, lord knows I have occasionally confessed to my own Chef obsessions here. For example, Chef Mark McEwan is certainly one of the Chefs in town who I admire. In addition to being a great Chef, supporting S. Pellegrinos’ Almost Famous Chef Competition, providing sold mentoring to his team, hosting Top Chef Canada, Mark is also a Second Harvest Ambassador and long-time supporter of Toronto Taste which I’m involved in running. He’s also a really nice guy. I loved seeing him at S. Pellegrino Almost Famous Chef Competition making time to talk to each of the competitors. And even to pose with them if their parents were nearby and wanting to take a photo. I’d probably even say I’m a fan since I start every conversation with him by awkwardly saying “Hi, you don’t know me but…” and generally being a little goofy. Okay, enough about my Chef obsession… Your turn to spill. Yes, you can enter through multiple social media spaces, but you only get one entry per Canadian Chef you mention no matter which method you use. For the purposes of this contest “Canadian Chef” is defined as a professional Chef who is Canadian OR a professional Chef currently working in Canada. will be selected Friday March 15th through a random draw from all the people who jumped through the hoop. Will be contacted March 15th. So, who is your favourite chef? I love Mark McEwan but my obsession is Michael Smith. There’s something about him that is magical. I’ve been known to creep his Wikipedia page and discuss his private life as if he was a celebrity from Hollywood. I regularly consult him (by him I mean his recipes) when cooking and didn’t even mind when he used to have his hair in a long braided ponytail. I’m a creep and would love to creep on McEwan by visiting Fabbrica! @rochlatinsky Then You might like these photos I took at @OCTA_licious a couple of years ago – https://www.flickr.com/photos/lexnger/tags/chefmichaelsmith @ChefMichaelSmth is also a great guy and a CheapEats celeb. @rochlatinsky Then You might like these photos I took at octa_licious a couple of years ago – https://www.flickr.com/photos/lexnger/tags/chefmichaelsmith chefmichaelsmith is also a great guy and a CheapEats celeb. I love you guys! So very Canadian! I don’t think @Chef_MarkMcEwan will be offended if you name other chefs in my contest. Right Mark? @AlexaClark Only slightly! But your glowing review will make up for it! @Chef_MarkMcEwan Mark did reply, on twitter saying “Only slightly! But your glowing review will make up for it!” Told you he was a good guy! Some of the best dining experiences of my life were at Perigee (RIP, sniff) while Chef Pat Riley guided the kitchen. He’s like a telepathic magical god of culinary wizardry with a tasting menu. It always felt like someone had secretly handed him a scan of my tastebuds and he had mapped out a way to make every single one of them tingle with every plate – the whole eating roadtrip was always a really breathtaking and intimate experience, and I developed a serious chef crush on him as a result! Anna, I love how you describe that! I heard Chef Pat Riley was at @FarNiente_TO, I wonder if @flozer knows if he’s still there. Anna, I love how you describe that! I heard Chef Pat Riley was at farniente_to , I wonder if flozer knows if he’s still there. I tend to geek out over Chef Jamie Kennedy. I still think back to a favourite meal at the chef’s table at JK Wine Bar, sampling every little thing put before us. I enjoy sampling his cooking every chance I get. @the2scoops I’m with you there @ChefJKennedy & his food are both certainly obsession-worthy. @the2scoops I’m with you there chefjkennedy & his food are both certainly obsession-worthy. I too enjoy Mark McEwan. I heard him speak at an event once and I was impressed hearing more about his experience. He’s definitely worked hard to get to his high professional level and is a role model that success is possible with a strong work ethic. @erikakomori Welcome Erika. I agree @Chef_MarkMcEwan certainly brings a strong work ethic and professionalism to the craft. Nice to see you join us, love your tips on contesting btw. @erikakomori Welcome Erika. I agree chef_markmcewan certainly brings a strong work ethic and professionalism to the craft. Nice to see you join us, love your tips on contesting btw. Wow, only 5 entries so far! Odds are excellent, wish I could enter, surprised YOU haven’t. I’m in love with David Lee. From my first meal at Splendido to Nota Bene today – I think I will just about follow him anywhere. My girlfriends and I sat beside him and his beautiful wife at Acadia and they commented to the waitress about how nice it was to see “young” (which we are not) ladies eating (not just salad). The comment made me blush more than people commenting me on my wedding day. @mtampoya Nice! Love this story and ladies who eat more than salad. kitchenfrolic That is strange but thanks for making sure I knew it was you. Hard to win if I don’t know you entered! Hey Stephanie, (aka kitchenfrolic) thanks for sharing. chef_lynn is definitely a favourite so far in this contest! I love the biscuits at Lynn Crawford’s restaurant, Ruby Watchco. They were melt-in-your-mouth good. @aglicksman mmmm biscuits! chef_lynn really is getting some serious love here. I’m currently mildly obsessed with Ryan Crawford, formerly of Stone Road Grille in Niagara-on-the-Lake. He left SRG at the end of 2012 and is now preparing to open Gastrohomestead, but not until 2014. I loved what he was doing at SRG and it’s killing me that I have to wait over a year before I get to eat his cooking again. It’s amazing how waiting for our favourite chefs to find a home (or create a home) can be so painful. Let’s see…Canadian chefs I admire…there’s the obvious big names Susur Lee, Martin Picard (http://foodieprints.com/2012/11/filling-out-the-canadian-identity-dinner-by-picards-cabane-au-sucre-to-open-ottawas-wine-and-food-show/)…and, bigger names in Toronto Martin Kouprie (of Pangaea), Jason Bangerter, Claudio Aprile,.. But, the ones who are my favourites work to mature the food scene in the National Capital Region. Ottawa has been seen as a lost cause for too long. Changing this perception is a difficult, soul-sucking, and largely thankless job. Top of that list of chefs would be Steve Mitton of Murray Street Kitchen. The man worked to establish Ottawa’s modern food identity. While “farm to table” is a choice in many cities, Ottawa has 1300 farms. It isn’t an option here. Does local or seasonal necessarily mean better food? Not necessarily. But, the menu Mitton sets out explains why people make the assumption. From house-made charcuterie to German and Austrian-inspired comfort dishes, you cannot leave Murray Street Kitchen without that satisfied feeling. @DonChow I love your comment that farm-to-table … “isn’t an option here.” It’s one of the things I love about Ottawa and it’s great to see people like Chef Steve Mitton murraystreetkwc showing that at the table. @DonChow since I stipulated that “you do need to tell me something about them and why you are obsessing over them”, I can only give you 2 entries for this… one for Steve Mitton and one for Martin Picard. If you want to say a bit more, or share links to posts, about the others I’ll happily give you more entries in the draw. Sadly, I’ve just realized that most of my favorite chefs aren’t Canadians. Sad — I need to rectify that! I do have a few favorites, though. I’ve been an unabashed fan of Adisa Glasgow ever since 3030 opened and he took the helm of the kitchen. He’s really great at creating dishes that are affordable, delicious, but also well-suited for the bar-style atmosphere of 3030. Jeff Claudio is a standout too: his original tasting menu at Yours Truly rivaled the tasting menus at places like Eleven Madison Park, and his creativity is pretty impressive. And of course, out west, Brad Miller is a marvel with eggs, and all sorts of other things. Red Wagon may be casual and diner-like, but the food is superlative. @vasta yes, you do have to rectify that! I’ve been hearing lots of great things about 3030 and Chef Adisa Glasgow (aka @soletrini) at the helm. Nice to hear about Chef Jeff Claudio ( @noodletripping ) at @YoursTruly229 and our first Vancouver addition to the list – Chef Brad Miller from @RedWagonCafe. That’s 3 entries for you my friend. Good luck. yes, you do have to rectify that! I’ve been hearing lots of great things about 3030 and Chef Adisa Glasgow (aka soletrini ) at the helm. Nice to hear about Chef Jeff Claudio noodletripping at yourstruly229 and our first Vancouver addition to the list – Chef Brad Miller from redwagoncafe . I love Chef Nuit Regular from Sabai Sabai Kitchen and Bar. She always accomdates my food allergy and her northern Thai cuisine is above all I have had! She is a petite woman who knows exactly what she’s doing! Graham Kerr … The Galloping Gourmet (before your time most likely). Bonnie Stern … great cooking schools and lots of cookbooks. Lucy Waverman … similar to Bonnie but I don’t think she has a school. I took classes with Bonnie Stern … very nice lady who learned Indian cooking in India! Michael Blackie formerly of the NAC now onto NEXT his new venture. He creates cutting edge cuisine that is somehow still familiar. He avoids the trapping of esthetics with no taste too! He is also philanthropic and gives back to his community. Undoubtedly the best-known cooking expert Canada has produced, Jehane Patenaude was born in 1904 to a well-known Montréal family. She studied in Montréal and at the Sorbonne in France, where she studied the chemistry of food. On her return to Montréal, she began a cooking school and opened the restaurant le Salad Bar. In 1934, as part of the anniversary celebration of Jacques Cartier’s arrival in Canada, she was asked to open a restaurant featuring traditional dishes on Île Sainte-Hélène. Her fame spread and before long she was writing food columns and books in both French and English — many of her books are available in French and English editions — as well as appearing on radio and television, where her folksy charm made her a country-wide favourite. Jehane Benoit has been described as an archivist of Canada’s culinary past who raised cooking from the status of ‘women’s work’ to an act of love that was one-part science and one-part celebration. This may be her most important legacy. Alex Gill nice to be hearing about some Canadian Chefs outside the GTA too. Sounds like Chef Jeremy Charles is doing some great stuff. Sarah Didora I’m a fan of Chef Nuit Regular as well and that Toronto needed her cuisine. I’ve been lucky that my old office was next to Khao San Roadd when it opened, and my new one is close to Sabai Sabai Kitchen and Bar. Thanks for sharing! David John Shaw ah Graham Kerr – he was my first Chef Obsession. I watched him as a child instead of cartoons. I also met him once in a restaurant in Ottawa, my family were horrified by my staring but he came over and said hi. With Kerr, Stern and Waverman, you now have 3 entries in the draw. Thanks for sharing! Heather Hickey I hadn’t heard that Chef Michael Blackie had left the NAC, very excited to hear about his new venture. Thanks for the update and for adding him to the list! Brad Darbyson Madame Benoît is a wonderful addition to the list, thank you for the background too. gillianplummer I of course love chef_markmcewan and chef_lynn ! They’ve inspired me to appreciate Canadian food! wallibina #AFChef13 #Chefobsession My other fave chef is the stupendous mattkantor . Great food, big heart. wallabina #AFchef13 #chefobsession Dan Pantano @glaswinebar glaswinebar . Best veg food in the city. Celery root pappardelle with truffles. Sigh. A couple of more through twitter. Note: taurafoxwalker has been asked for a bit more “about” Chef Kenji Kato and/or about her obsession to qualify. My current obsession is Matthew Kershaw, chef/owner of Rapscallion and The Alex. House made charcuterie and pickles, and embracing nose to tail eating give him top marks in my books. @Andy Wagner Thanks for telling us about Chef Matthew Kershaw of rapscallionrest and alexrestaurant Sounds like trips to Hamilton & Burlington are in order. You have until Thursday to enter – tell me about your favourite Canadian Chefs (more than just their name) to be entered to win $150 at Fabbrica. You don’t have to live in Toronto, just come to Toronto at some point in the next 12 months if you do win! @carole nelson brown What a great back story! I completely understand where you are coming from thank you for sharing! Good luck! Chuck Hughes… he makes drool worthy food..and is hilarious, Chef Lynn Crawford who makes stuff I would never think of, Chef Mark McEwan who has a love of quality food. Chef Roger Mooking who is a spice expert with big flavours. Chef Bob Blumer who makes food fun. Chef Michael Smith who makes food I would make at home. Matt. Pick one. Kantor, Pettit, Basile, Blondin, Matheson, Sullivan… They all make food I like to eat and have a name that’s easy to remember. beers.) So let’s see mattKantor, Matt Pettit from RockLobsterFood, Matt Basile from fidelgastro, chefMattBlondin, mattydeathbroGastroMatthew – that makes 6 entries…though I wouldn’t hate a bit more “about” each of them for your entry. hard to choose! i’d say chuck hughes for how down to earth and communal he is, but i also love the simplicity of michael smith. right now, my vote is for chuck hughes. ruyoungBoth chefMichaelSmth chucksdayoff are great. You’ve got 2 entries! Good luck. I second Ryan Crawford – I have had the pleasure of cooking with him as part of LesMarmitonsInternational as well as eating at The Rest. He is a wonderful teacher and charcutier. So many I could mention but will conclude with yet another LMI connection – Stefan Weser who with his partner Andrea Jennings run Springbank House in St Catharines. A wonderful Dinner, B&B. Linda- thanks for your Chefs! If I count correctly that’s 6 chefs you’ve told me about, and that’s 6 entries in the draw. Thanks for sharing and good luck! Alex – I love the inclusion of more Chefs outside the GTA and your reasonings. That’s 3 entries for you, good luck! My favourite chef is actually a chef duo: Franz and Esther Hochholdinger. They own two restaurants in Mississauga. The Apricot Tree in Erin Mills, which is their first restaurant, was opened in 1993. I remember travelling from Scarborough out to Erin Mills at the time to have lunch with my sister. They have always had an open concept kitchen, and back then, the location was very, very small – it sat less than twenty people. My sister ordered a schnitzel and while we were waiting for our lunch the kitchen suddenly errunpted the with sound of rapid pounding! I cracked up. You know your food is fresh when you hear it being prepared! The menu back then was a small chalkboard tucked into a corner of the restaurant. As they ran out of an item, it was wiped from the board. Fresh has always been important to the Apricot Tree. Our family fell in love with the Apricot Tree and on almost a monthly basis we would pile into our car and drive an hour and a half just to eat at The Apricot Tree. Eventually the restaurant moved into a larger location in Sherwood Forest and I moved to Brampton. My brother, who had just graduated from college, moved in with me. Every Sunday night we would venture down to the Apricot Tree for dinner. It truly is worth a drive out to Mississauga to try the Apricot Tree or Bistro Narra. I suggest eating from the daily whiteboard menu, although there are amazing offerings on the regular menu as well. Right now, they are celebrating their 20th Anniversary and are running their annual Crepe Festival at the Apricot Tree. Their savoury crepes are outstanding, and well worth the drive. And save room for dessert…Franz is an eight generation pastry chef from Austria! The tortes, crepes and strudels are out of this world! I confess. Who isnt in love with Mark M. And like you I always intoduce myself with “you probably dont remember me…. But 15 years ago when I thought I could cook, my husband gave me cooking courses for my birthday with a fairly unknown chef (off the island) at the time – there had been a write up about him in The Globe and he was offering weekend courses at Inn at Bay Fortune. How wonderful for both of us! My husband could play golf and I would be with a group of people who LOVED everything about cooking. We arrived and it seemed oddly quiet; however we checked in and I knocked at the kitchen door. A very tall man with waist length hair in a pony tail answered and it was obvious in a few short minutes that we had not received the cancellation call. Michael Smith promptly said “well then, no problem, I guess you’re getting one on one cooking lessons and because we have restaurant guests, tomorrow you can help out in the kitchen”. What a gift. Chef Smith took me through his entire lessons with such sincerity as if picking watercress and driving down to the lobsterman and choosing dinner with a complete stranger was just the way you did it in PEI. Between the tallest salad in the world and the cabernet tart, I knew then that what you eat is just as important -and tastes better- when you know where it comes from – and particularly when its made by someone who truly understands and loves cooking! The fact that he was very charming was an added benefit I kept saying to my husband after his weekend of golfing. Chef Smith is a perfectionist in his kitchen and to this day whenever I serve his Bay Fortune Chowder, I remember how important it is to make your guests feel special. AND the contest is closed. Final tallies and draw will be done today! Let the drum roll begin! https://twitter.com/search?q=%23AFChef13&src=hash https://twitter.com/search?q=%23ChefObsession&src=hash One of my FAV Canadian Chefs is Mark McEwan who once told me I should move if I want to be near his restos. https://twitter.com/search?q=%23AFChef13&src=hash https://twitter.com/search?q=%23ChefObsession&src=hash -my favourite Canadian Chef is Chef Michael Smith because he gives practical suggestions when cooking for children. Our winner has been selected in the #AFChef #ChefObsession contest and we have compiled a list of all the obsession-worthy Chefs you have told us about.